What do you do when you learn that an ally is a science denier? This is the fascinating problem our team faced last week, as we prepared for our “Corridor to the Stars” fundraiser. 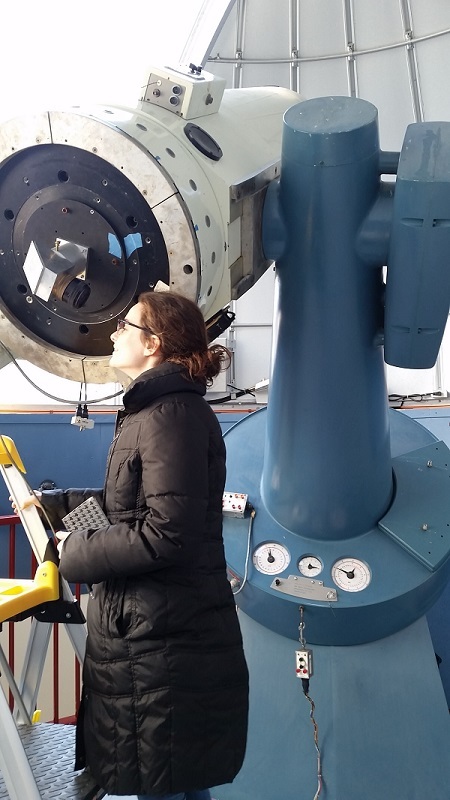 Claire Tucci, the UIowa graduate student who organized the event, came with me to visit the observatory for the first time, meet the people, and work out the final logistical details. We were very impressed by the facility. Local people with a genuine passion for astronomy had planned and built a marvelous complex with funds from a mixture of private donors and public grants. The exhibits were top notch, with high-quality NASA software, incredible telescopes, and beautiful historical artifacts. Volunteers literally built this facility! The place was absolutely full of marvels of engineering and craftsmanship. And then I had to bring up climate change. What if we did another event in the summer, maybe take some kind of a Spaceship Earth angle? The response was, shall we say, clear and unmixed. Climate change was not a topic they wanted to discuss at this facility. At least half of their volunteers hold strong opinions that conflict with the scientific consensus. An interesting discussion arose, relating to some of their volunteers’ opinions on the origins of the universe and deep time. Young earth creationists have given seminars at the facility, and at least one active volunteer is an active member of that community. The volunteers giving us a tour explained the argument this person makes to reconcile astronomical data with the timeline of young earth creationism. What a strange and exciting turn for our afternoon to take! Our intern had never encountered this sort of science denial before. And what an excellent and interesting place for a young scientist to encounter the phenomenon for the first time. No one visiting the facility or talking to the volunteers could think they were unintelligent, could deny that they command significant resources, or could question the excellence of their technical skills. And we obviously weren’t going to pick any fights with people who were providing the facility for our event in two days! No, what we did was move the conversation to safer ground, like our shared affection for giant robotic telescopes, and continue with a platform of mutual respect. We returned home to reflect upon the matter and reconvened the next day to discuss it while cutting up a large quantity of cheese for our event. What do you do when an ally denies? We like and respect these people. We want to continue working with them! We want to understand what is at the root of their science denial. It's not a matter of stupidity nor ignorance—the first and often unfair accusation made by people on the side of science. Nor is it related to despair—a piece of the puzzle I still believe is important—but is clearly not the whole picture. After all, we’re dealing with engineers here, we can’t claim they’re flying based on emotion—at least, not all the time. How can we figure out what is at the root of their science denial? Perhaps by talking with them. And we can’t do that unless we can approach them with genuine respect, and a real appreciation for their strengths. The lack of dialog in our country, the incredible and painful degree of polarization, only increases conflict. If people feel like they can’t talk about these topics, we cannot come to understand each other. Engaging in dialog is not the wimpy way out. We don’t have to let go of our beliefs to engage in dialog. Without building our understanding and engaging all the allies we can, we can’t be as strong as we could be. And we can’t fight threats to science education if we don’t really understand them. We’re going to see what we can build here. There has to be a way we can engage with dialog about climate change with people who love NASA. NASA is a leading source of research on climate change! When an ally denies, our cultural defaults encourage us to engage in mockery, because denialism threatens our core beliefs. Instead, with the Science Booster Club Project, we’re going against the grain and trying to engage. I don’t have a problem with people having different beliefs. But what does upset me profoundly, is when these beliefs control children’s access to science in public schools. This is the second time I’ve encountered the young earth creationist movement in this area. The first time was when I was doing field work with rural science teachers. One of them told me they were not allowed to teach their third graders about erosion, because parents had objected on the basis that they did not want their children being exposed to concepts related to geologic time. That’s a real problem. How can I find out what’s going on with these people? Not by mocking their beliefs. Not by being the person bringing more conflict into the situation. Maybe by building dialog and connections with the larger community. Maybe by bringing in a NASA scientist to talk about climate change via NCSE! An aggressive or argumentative approach hasn’t solved the conflict around science denial, it’s only driven it underground. Let’s work to bring it up and talk about it. It’ll be interesting.